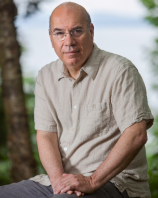 Jay Parini is a poet, biographer and critic who has published seven novels, most notably THE LAST STATION, which was made into an Academy Award-nominated film in 2009 and translated into over 25 languages. He is the D. E. Axinn Professor of English and Creative Writing at Middlebury College, and the author of PROMISED LAND: Thirteen Books that Changed America. The product of 30 years of friendship and conversation, Jay Parini’s EMPIRE OF SELF probes behind the glittering surface of Gore Vidal's colorful life to reveal the complex emotional and sexual truth underlying his celebrity-strewn life. But there is plenty of glittering surface as well --- a virtual Who's Who of the American Century, from Eleanor Roosevelt and Amelia Earhart through the Kennedys, Princess Margaret and the crème de la crème of Hollywood.